There are two different methods for setting up remarketing lists, either through Google Analytics or Google AdWords. If you are planning to use RLSA (remarketing lists for search ads) though you will have to create and use the AdWords remarketing list. 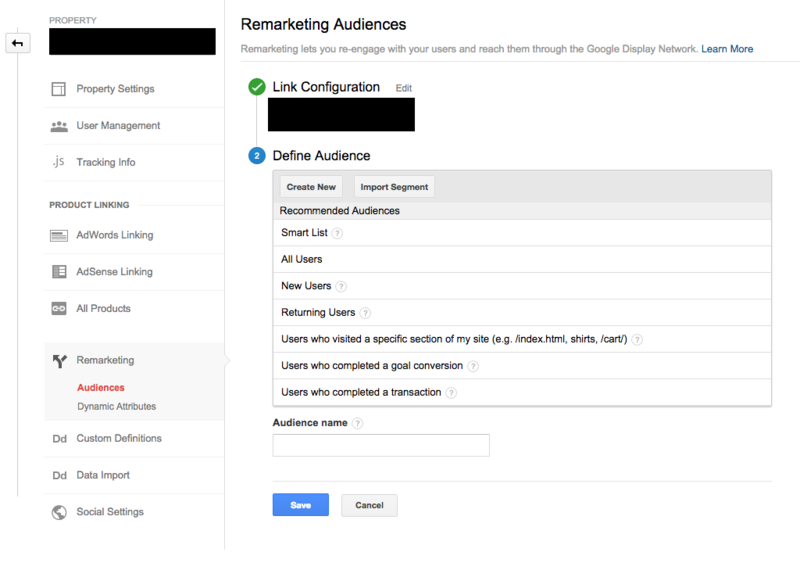 Creating the lists through analytics alone only allows for running remarketing on the GDN (Google Display Network) & dynamic remarketing. 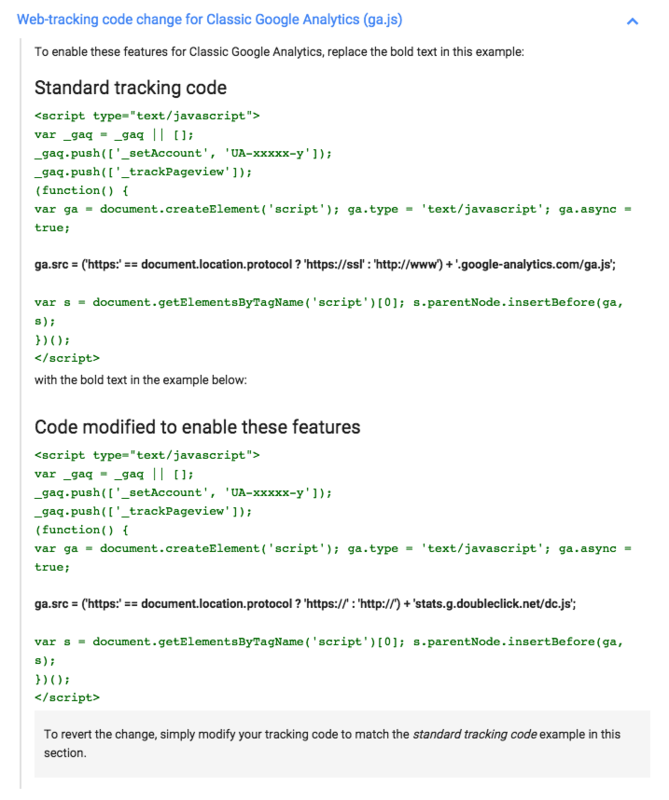 Firstly you will need to add the remarketing tag to your site, this is a small snippet code that you can get from AdWords. Click the ‘Audiences’ tab & then ‘Set up Remarketing’. 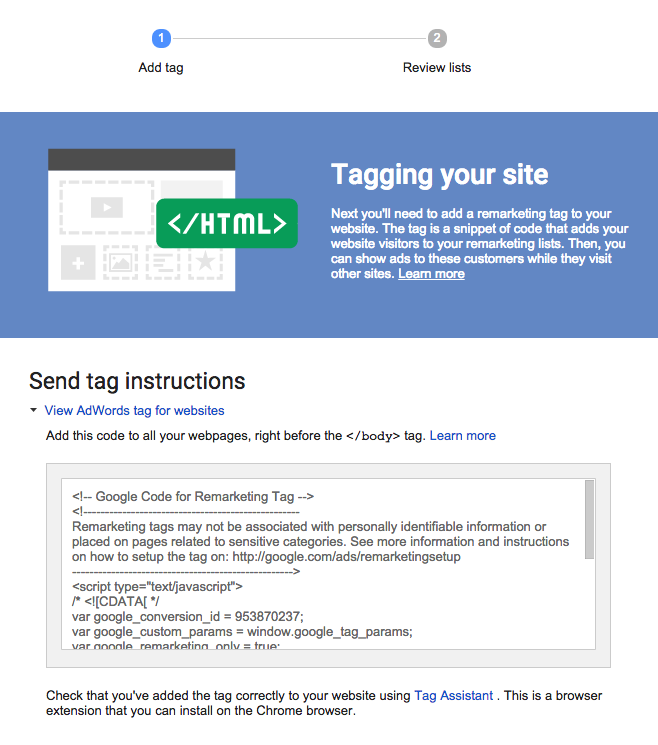 Click ‘View AdWords tag for websites’ it will then display your remarketing code. Copy the remarketing code and click ‘continue’. You will now need to paste this code into the footer of every single page on your website. Just before the </body> tag. There are two different methods to create a remarketing list in google analytics and it all depends on what current analytics tracking code your site is using. Both will need new lines of code adding into them if you want to be able to conduct remarketing. This will need to go between the ‘create’ & ‘send’ commands as you can see below. 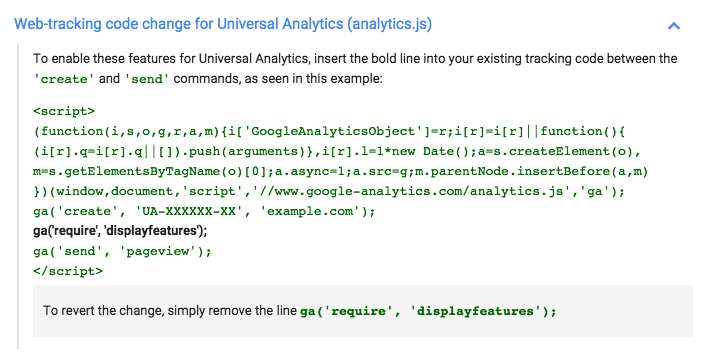 Below is the classic analytics tracking code, you will need to also make a slight change to this if you want to be applicable for analytics remarketing. Once you have completed added the tags to your site next is to create your remarketing lists. For example: You may want to create a remarketing list for all of the users that made it to your ecommerce checkout but never fulfilled the purchase. When the consumer visits this page the remarketing tag will tell AdWords to add them into the list you have created. Click the “Audiences” tab & then “+ Remarketing List”. Next step is to add the rule, the example below shows that all visitors that have viewed a page containing the URL structure of /Mens/Shoes will be in this remarketing list. Click ‘Save’ and your list will be created. Enter your usual analytics reports. Click ‘Admin’ the last tab in the menu bar. Under the ‘property’ category select ‘remarketing’ & then ‘audiences’. 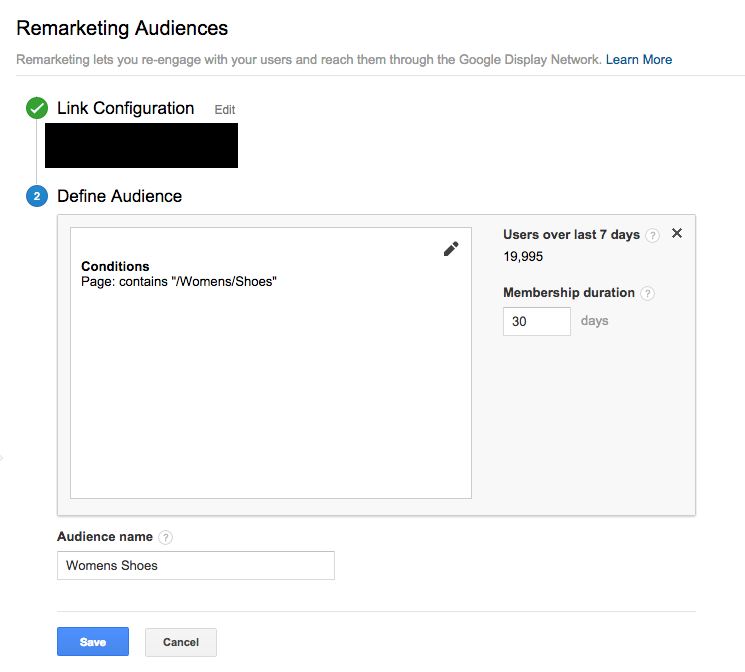 If you have not already you will need to link your analytics to your AdWords account. Click ‘+new audience’ & then select your advertising account and follow onto the next step. Click ‘Create New’ – then click conditions. Then find ‘Page’ & ‘Contains’ and enter the URL’s you want to target. In this instance every visitor that viewed a page which URL contained /Womens/Shoes will be in the remarketing list. 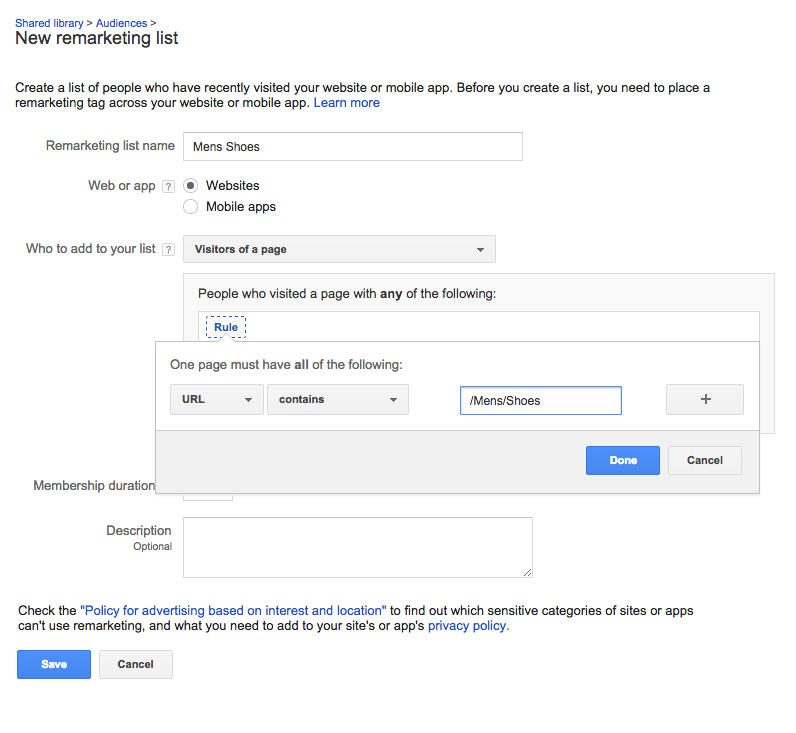 Click ‘Save’ the remarketing list is now done and will appear in your AdWords account. Customise your remarketing lists, experiment and set up a variety to trial in your campaigns. E.g. – Checkout bailouts, specific page viewers, customers who purchase Y and X but Z will also be of interest to them. Analytics remarketing cannot be applied to RLSA campaigns. The more targeted a campaign is, the higher its conversion rate will be. Give all remarketing campaigns a try; viewers of your site are most likely to convert on their 2nd or 3rd visit rather than the first. When it comes to measuring the effectiveness of Remarketing it is easy to miss the real value. Our earlier post on the different methods of Goal Attribution in Analytics will help you see the part remarketing plays in the conversion path. You might be quite surprised just how influential remarketing is. I hope you found this article helpful but feel free to contact us if you need any further support with your Remarketing campaigns. Plays a crucial role in supporting the account management team with their delivery and fulfilment. Great all rounder with an eye on account management next.